Yesterday unfortunately Aidan's IV in his arm closed up and the Vascular Access team couldn't find another vein to put his IV in (he needs it still for his antibiotics that he is on from when his stomach first was leaking) even with the use of an ultrasound machine they couldn't find anything so they had to use a vein in his forehead. Aidan was so brave, i know i definitely cried more than he did! 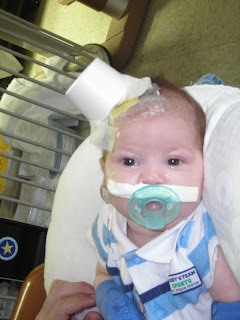 Afterwards they cut up a paper cup and taped that to his head so that he wouldn't mess with the IV, so now Aidan has this really cool party hat that is the talk of the Unit LOL. Aidan also got his 2 month shots yesterday, to reduce the amount of pain he would be in they numbed his thighs with something and then they had 4 nurses ready, 1 to hold his arms down and keep his pacifier in and the other 3 to give him simultaneous shots. So yesterday was quite an eventful day!! omg. seriously. he's getting so big and i'm missing it! i reallllly hope that this surgery is successful and you get back to jersey before fall creeps in.